mouth, but with music in your blood and poetry in your soul." Journey with Carl into the "otherworld" of the imagination where heroes and heroines; tricksters and fools come to life. Become immersed in a landscape, which is both familiar and strange as the old stories weave their magic. Stories to excite, to comfort and intrigue are contained in Carl's repertoire, tales that explain the world and help us understand others and ourselves. Carl has contributed to courses run by the Essex Schools Advisory Service on a number of occasions, working with both teachers and parents. His years teaching mean that the use of storytelling to aid learning and understanding is a very important aspect of his role as a storyteller. The joy and inspiration he got as a child, and still gets to this day, from stories has strengthened his belief in their power not just to entertain, but also to help us understand others and ourselves. During his 27-year career as a teacher of English in comprehensive schools in Essex, it was his love of stories, which helped make him popular with his students. "He brings a passion and imaginative flair to his teaching of literature" was one comment on his teaching. His tellings in schools had always generated praise from both pupils and teaching staff. To compliment his storytelling sessions, Carl offers English work linked to his visit and storytelling workshops for both pupils and teachers. Visits can be structured to fit in with themes already being explored in the curriculum, or project work undertaken. As well as many bookings during the normal school year, Carl has contributed to numerous Summer Literacy Schools. For each he devised challenging programmes for the students to work on. He has contributed to courses for teachers in Essex, and workshops for playgroup workers and families as part of reading and literacy projects. 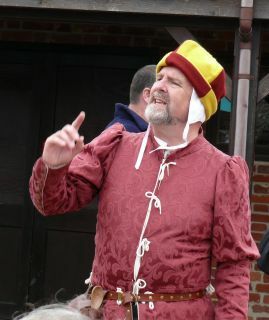 As well as schools, Carl tells at medieval events, sometimes in partnership with Andy; at country parks; village halls; community groups; theatres and museums. "...an inspiring storyteller who is able to enthral and excite junior and adult audiences alike. ... Staff always request his return." "Everyone was happy and admired your vocal range and relaxed manner."